It's almost here! My annual limited couples' sessions! This year I am particularly excited because I will be partnering with Urban League of the Upstate (in Greenville, SC) and Sowing Seeds into the Midlands (in Columbia, SC) to donate each session fee to these organizations! Click here to learn more about how to book. If you've already done so, you may have asked the questions, "What should I wear?" If my style had a motto, this would be it. Being comfortable is the most important thing you should consider when selecting your wardrobe for your shoot. There will be both poses of sitting and standing, so whatever you choose should be ideal for both. There are options that offer style and comfort, for both men and women. For women, consider a dress or jumpsuit. One-piece options eliminate the need to coordinating multiple pieces together. However, if you decide on a skirt or pair of slacks, feel free to get creative with the paired options. Men, a pair of khakis or your favorite pair of jeans you wear on date nights would work perfectly. Although all colors look great on camera, there will be some cuddling and canoodling during your session. Avoid bright, neon-like colors which could leave a color cast on your partner/spouse's face or clothing. Bold colors and neutrals will look better against the natural elements of both the venues in Greenville and Columbia. Coordinate, don't match. You and your partner do not have to both wear the same color tops and bottoms. You want to complement each other, not look like brother and sister (ouch)! Use contrasting and complementary colors to enhance each other's look. Take your outfit up a notch with some accessories; watches, bracelets, beads, or hats are all subtle additions that can add more personality to your session. 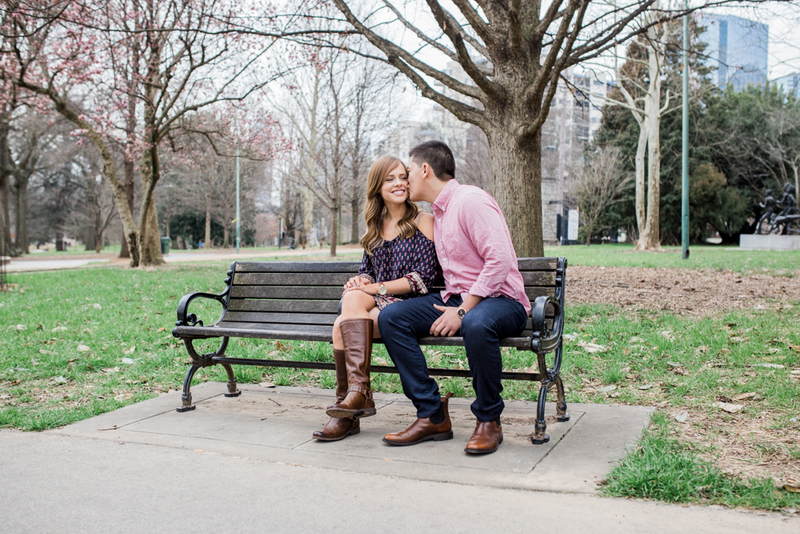 I have been ready for so long to announce these couples' sessions and they are finally here! I don't want you to miss out so click the link below to learn more about them and book a session. Availability is limited so please get your session booked as soon as possible! Stress is the #1 uninvited guest to a wedding day. After months of planning and gathering order, even the best of us might find nerves and stress creeping into our day of celebration. Through meditation with Black Mom's Guide to Calm, I've learned to acknowledge the distracting thoughts, let them go, then return focus to what matters most. Try this practice when you find yourself becoming overwhelmed on your wedding day, whether you're dealing with overbearing family members, stressing over the timeline, or trying to keep your heart inside your chest from sheer nerves. I've compiled a list of positive affirmations to avoid stress and help you find calm on your wedding day. I only attract good vibrations on my special day. The power of love will make my day perfect. I trust my vendors will be at their best. I inhale peace and exhale overwhelm. I focus on the thoughts that bring me peace and joy. I am relaxed and full of energy and inner strength under all circumstances. All unnecessary thoughts are leaving my mind now, letting me experience inner peace. All worries and anxieties are leaving my mind, making space for calmness and peace. I radiate peace and love to others, helping them to be in a state of peace and love. Looking for an easy-going photographer who will help you keep your cool on your wedding day? Contact me today to check if your wedding date is available!